IT was a strange moment. I felt I was witnessing something that could be described as the Empire Strikes Back! There in the grand panelled hall of the Royal College of Surgeons, under the smiling portraits of past presidents, sat more than 153 eager doctors, hat and gowned, about to receive their diplomas as qualified surgeons. And what was striking was that at least two out of three of the new surgeons were not from these shores – overwhelmingly Asian, a few Chinese, and some from the Middle East. This is medicine of the future! Go into any hospital in London and you’ll see the same pattern. But it hit me in the face on Friday afternoon at the RCS hall in Lincoln’s Inn Fields, Holborn. Most of these new doctors are from the old Empire. But we need them now as much as they wish to practise here. He was reflecting the anguish of most of these new graduates – most of whom have been working in hospitals for four or five years – who still haven’t been able to find a job as a result of the chaotic online recruitment system waved into being by the wand of the most unpopular health secretary of modern times – Patricia Hewitt! If they don’t get a job by the cut-off date of August 1, they’ll either start collecting benefit payments or have to accept a lower hospital post. 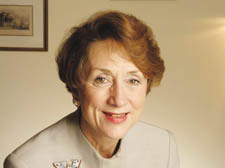 In her key address, an apologetic Dame Carol Black – recently president of the Royal College of Physicians who worked at the Royal Free hospital – asked the anxious graduates to hang in there in the hope that all would be well in the “transitional period”. Then, reflecting the growing disillusionment of doctors with the NHS, she urged them to become more “involved” with the management of hospitals. This will upset the army of pen-pushers who run things today, but she clearly wants doctors to be part of the “leadership” of hospital trusts. What a great idea! Minutes after the ceremony had ended, the grandees who had sat on the platform, made their way in a long file out of the hall, to the accompaniment of a piped Hadyn march, and into a reception – for canapes, tea and cakes. I had only noticed two African-Caribbeans among the doctors and tracked one of them down – a young man, in his late twenties, with his proud father, also a doctor. Originally from Tanzania, he was off to a job in Toronto. Aware of the buzz point made by Dame Black, he agreed that doctors should play a bigger part in running a hospital. “And why not other members of the staff?” chimed in his father who practises in Kent. “Why couldn’t the head porter, say, be on the Hospital Board?” he said. And why not, I thought. But will that ever happen? Why so few black people among the graduates? “As an ethnic group we don’t provide enough role models,” said the young doctor. The only other African-Caribbean graduate, could count herself as a role model. Her mother had come from Trinidad in the late 50s, settled in Kentish Town, and often slaved away at two jobs to make enough money to bring up five daughters. Now, via Parliament Hill School and later St George’s Medical School, the new graduate has become a member of a select club in the UK of about a dozen African-Caribbean eye surgeons. SEEING the cartoons that make up the world of Biff made me come over all nostalgic. At first, I thought this may have been because of the decidedly Boys Own weekly style of art the cartoonists favour, but then I realised it was a hankering for some thing else altogether: Biff first appeared on the pages of the Guardian 20 years ago when the creators, Mick Kidd and Chris Garratt, were asked to stand in for Posy Simmonds. But like all good understudies, they never knew when their role was over, and continued to file their bizarre pieces of social commentary each week, until the unthinkable happened: The Guardian, that bastion of broadsheet production values, downsized to the current Berliner format, and with it, editor Alan Rusbridger, who lives in Kentish Town, decided that this meant there was no room for poor Biff. But fear not! The work of Mick – who lives in Highgate – and Chris lives on, at a retrospective of their works at Gallery12, South Hill Park, Hampstead, starting this week. As our illustration shows, it is a perfect mix of well-produced pop art with a hefty dose of satire thrown in. I ADMIT I’m often off-key when meeting passing stars of the political firmament. There were lots of them from the past and present at the Town Hall last week, gathered for the ceremony honouring long-serving Roy Shaw. From ex-Hampstead postie, now Lord Tony Clarke, Frank Dobson and Ken Livingstone, to solicitor David Offenbach, who helped set up this newspaper. I had heard the story before from Health Secretary Tessa Jowell of how she had entered politics by mistake. But I still chuckled, and said ‘Oh, yeah” to myself. Tony Clarke reminded the audience of how Tory Hampstead had been so Tory that the first council houses were met with an outcry from its denizens. Wondering why Roy Shaw never tried to get on to the Labour council of St Pancras but picked Hampstead instead, Ken Livingstone thought he may have seen the future – and didn’t like it. Leading St Pancras at the time was a hard-boiled political rebel, John Lawrence, who, along with other socialist councillors, got enmeshed in the famous rent strike of 1960 involving thousands of council tenants. It ended in street battles, national headlines – and perhaps Roy didn’t like that at all. By contrast, Roy was a respectable figure. Even so, he had to face a High Court judge. It happened when Ken, Roy and all the Labour councillors had decided to meet a steep wage claim from the council’s manual staff. The councillors then faced a steep surcharge. But the judge, aware of Roy’s celebrated reputation of respectability, acquitted them. He just knew that Roy’s motives were pure – here was a man who wouldn’t have gone about simply making “political gestures,” concluded the learned judge. PEOPLE’S power brought St Eugene De Mazenod primary school into being 40 years ago. And this will be celebrated at the school’s birthday garden party on Saturday. The school was built after a surge in Irish Catholics in the area, and parents, along with the church, clubbed together to pay for it. Former head Valerie Robertson – she stepped down recently after 27 years – will be one of the principal guests along with the Bishop of Westminster Bernard Longley and the Camden mayor Dawn Sumpter. PLAYWRIGHT Peter Nichols, who lives in Belsize Park, was responsible for the darkly humorous play A Day in the Death of Joe Egg. The film version, about a couple who have to face up to a life of looking after a daughter who is almost completely brain dead, touched many. It has come to my attention that the rather retiring writer is due to appear at Belsize Library on Tuesday night to talk about his work and read from his diary. The film starred Janet Suzman, who recently spoke at a similar gig for Heath Library. Peter has a reputation for being shy – so this chance to hear him discuss his work is one I won’t want to miss.